Workhorse of the machine shop. Does so many different jobs so well. Use it on lathes, millers, grinders, planers, shapers or drill presses to check a wide variety of dimensions on many different size and shape parts without removing them from the machine. Checks internal or external runout, eccentricity, roundness, radius, taper, height, flatness, depth or thickness of parts while they are stationary or in motion. Displays changes from pre-established settings during the machining process. Case hardened holder fits most tools posts. Furnished in durable, fitted case. Weight 2 lbs. Also available with upright indicator (Model 22C). .... . These well known Ames gages are the economical answer to many gaging problems, especially when dimensions are difficult to reach. While models 12 and 12B serve a majority of requirements, Ames has many special jaw designs on file (a few shown below), one of which may be just what you need. 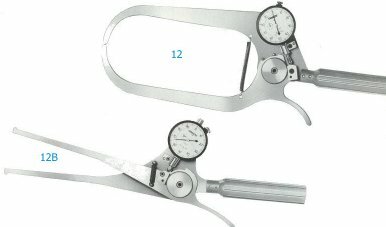 All caliper gages have the inherent problem of cosine error. Only Ames caliper gages incorporate an error correcting cam (above) which compensates for this error, so you can count on greater accuracy when you buy Ames. Indicators : Equivalent metric models. Plain bearing, jeweled, or jeweled-shockless movement. Contacts : Steel or tungsten carbide, swivel type, interchangeable type. Long reach caliper for checking base thickness at bottom of deep recess. Internal caliper with locator for checking shallow bore. Contacts are back tapered. Upper jaw has swivel contact so faces can remain parallel over wide range. Specially contoured jaws for checking minimum wall thickness of valve assemblies.